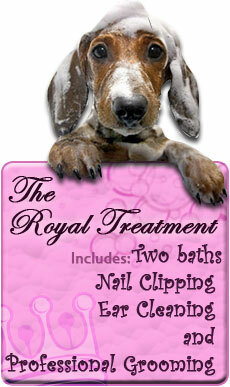 The staff at Amy's Royal Treatment have a natural way with the most difficult dogs. 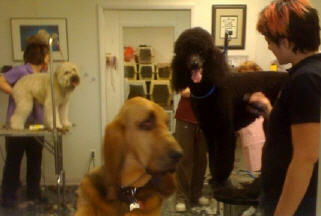 We only keep your dog long enough to complete their grooming. We do NOT keep dogs in the crate all day long and they are to be picked up as soon as they are finished to help ease their anxiety. It’s calming, cleansing, color brightening, and the scent is delicious. South Bark’s Blueberry Facial is all natural, tearless, and made in the USA. Request one from us! Angels’ Eyes is the first product developed specifically for both dogs and cats to eliminate unsightly tear stains from the inside out. 100% wheat and dye free! 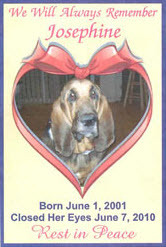 Safe for all breeds! Dogs will have the dead hair brushed out and will receive 2 baths, a creme rinse ear cleaning, nail clipping and pad-hair trim. Matted cases require a blade between the skin and the matt, which the dog must remain still. We do severally matted dogs but it is a delicate process and an extra charge. We offer brush outs only in half hour morning sessions. We have a vast variety of shampoos to choose from, like Oatmeal (for dry or flaky skin), Medicated, Flea & Tick shampoo which only kills what it comes in contact with, leaving no residual effects, and a De-Skunking shampoo for a run in with those black and white friends. We are happy to bathe with any shampoo that you request or bring in with you. We dry without heat. If you get a new puppy we suggest bringing it in at about 12 weeks old for a couple of short visits to familiarize him with all the sights and sounds of the grooming salon before his actual appointment. The most important accomplishment of our puppy's first grooming session is ... that he likes it! We want his first experience to be positive because it will stay with him forever.